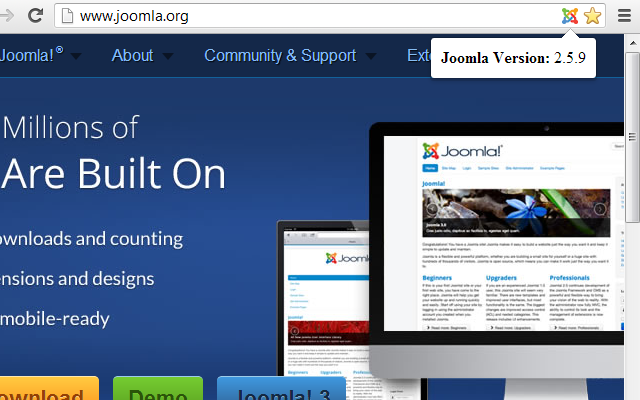 Version Check for Joomla is a web browser extension that checks if pages are powered by Joomla, what version they are running, and indicates if the version in use is outdated. It is available for Chrome. You can get access to all of our version checking extensions capabilities in one extension using the Version Check extension. The extension is localized for the following languages: Bulgarian, Catalan, Chinese (Traditional), Chinese (Simplified), Czech, Danish, Dutch, Estonian, Filipino, Finnish, French, German, Greek, Hebrew, Hungarian, Indonesia, Italian, Japanese, Lithuanian, Malaysian, Norwegian (Bokmål), Polish, Portuguese (Brazil), Portuguese (Portugal), Romanian, Russian, Slovak, Spanish, Swedish, Turkish, and Ukrainian.